I was ready to give the New Zealand Navy the benefit of the doubt. I thought they had the courage to actually take on a bunch of high seas poachers if not for the unsurprising timidity of politicians like New Zealand's Minister of Foreign Affairs Murray McCully. But the recent comment by HMNZS Wellington Commanding Officer Graham MacLean has made me reassess my opinion of the New Zealand Navy. According to MacLean the mission was "a resounding success despite the lack of arrests." Commanding Officer MacLean says he does not have much respect for Sea Shepherd. Apparently he has made it clear, and I quote, that he "can't see the likes of Sea Shepherd and the Navy working together." Captain Sid Chakravarty on the Sea Shepherd ship, Sam Simon responded that "a little bit of assistance from the Navy and the government would mean they could find illegal fishing boats lurking in the Southern Ocean far more quickly." But that level of cooperation is unlikely. Sea Shepherd Captain Chakravarty says that's been the story all along. "I can't say I'm surprised. I think it can be expected of the government to have that attitude. But regardless, Sea Shepherd will go ahead; we will confront these vessels and we will shut down their operations." The facts are clear. The three poaching vessels found by the New Zealand Navy are listed by Interpol as clearly illegal. The HMNZ Wellington was sent to the Southern Ocean to patrol and search for illegal fishing vessels. They found them. So what is the point of searching for poachers, finding the poachers and then letting said poachers continue poaching? The poachers did not even try to stop fishing after the Wellington found them. They simply ignored the New Zealand Navy and continued poaching toothfish. Commander MacLean proceeded to lament to the media about the rough sea conditions, cold weather and potential dangers. One needs to wonder why the Navy even bothered to venture into the Southern Ocean in the first place if they are concerned about rough sea conditions, cold weather and potential dangers. For Commanding Officer MacLean to describe this as a resounding success is ridiculous. Maybe he is trying to convince the public that it was a resounding success, but the reality is that it was a pathetic and cowardly failed intervention. These three ships will be hauling hundreds of tons of toothfish from waters supposedly protected by New Zealand and the Navy simply allowed them to continue. This is not a success by any stretch of the imagination. What these poachers demonstrated was that the Navy is utterly impotent. They know it, the Navy knows it and the public knows it too. Meanwhile the "likes of Sea Shepherd" have shut down one poaching operation, confiscated more than 60 kilometers (approx. 37 miles) of gill net and deprived the Nigerian-flagged Thunder of millions of dollars in profits. Sea Shepherd is now working to head off the three poaching vessels that the New Zealand Navy let go. And Sea Shepherd is doing this without a single tax dollar from New Zealand or Australia, while suffering distain, criticism and harassment from both governments. 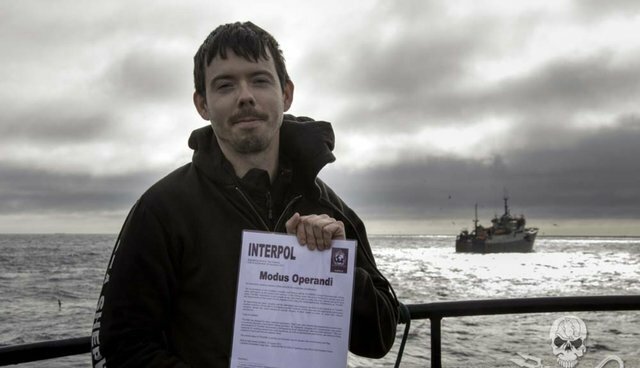 Sea Shepherd also expects that this success in the Southern Ocean will be met by even more harassment when the Sea Shepherd ships return to port, because of ridiculous accusations that by hauling in the abandoned nets, Sea Shepherd faces the possibility of charges for "illegal fishing." The fact is that the world's governments simply lack the economic and political motivation to tackle the issue of illegal fishing. There is no enforcement, the poachers are given ridiculously small fines when on the rare occasion they are caught and they are even receiving subsidies from the very governments that are supposed to be shutting down their illegal activities. The Navy is saying that their mission is a success because they filmed the ships and took evidence of their catch. According to the government, this means the poachers will have a problem offloading their catch. However, last year the Thunder was detained in Malyasia. They paid a $90,000 fine and were allowed to leave with a catch of toothfish that was worth millions. The fact is that if these three ships have cargos worth millions of dollars, they will find a port to offload for the simple reason that there are plenty of ports where port officials can easily be bribed. If unarmed Sea Shepherd ships crewed by volunteers can shut down a poaching operation, confiscate the gear and deprive the poachers of their cargos, the armed and better equipped Naval ships could do the job more easily, if they had the will to do so. The fact is that they do not have the will and they lack the motivation to protect the ecological integrity of the Southern Ocean, and no amount of justification by Foreign Affairs Minister McCully or Commander MacLean is going to convince us that they actually are seriously concerned with addressing the problem. Last week their excuse was that they were low on fuel. Yesterday the Wellington was refueled. If they are serious they will depart and return to the Southern Ocean. They have the means to locate the poachers again. They have the means to shut them down. The Sea Shepherd ship Sam Simon is heading for these three pirate fishing vessels. The New Zealand Navy could assist Sea Shepherd in stopping the continuing theft of what the poachers call "white gold." My bet is that the New Zealand government and Navy will do nothing, that they will allow volunteers, including Sea Shepherd Kiwi volunteers on the Sea Shepherd ships, to take the risks that they will not and to undertake the responsibility from which they have walked away. And to add insult to injury the government and the Navy will criticize and condemn Sea Shepherd for taking any action at all - because, after all, they can't be associated with "the likes of Sea Shepherd."